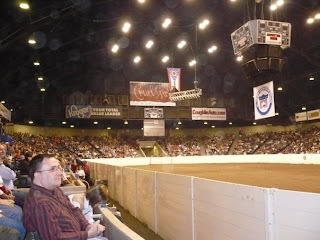 Quarter Horse Congress: The world's largest single breed horse show....OR, the best place to see lots of quarter horses and go SHOPPING! After marvelling at all the sights and sounds of Congress for several years, I finally planned a trip for some students/friends to go too. 5 of us packed into a borrowed car (my mom's Acura TSX, which proved to be a lot smaller than I originally thought - think "How many people can fit into a VW Bug?" and you've pretty much got our 6 hour drive back from Columbus). 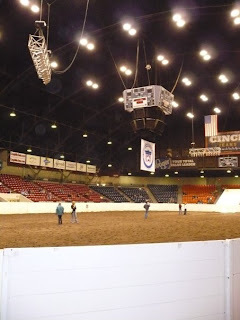 By 11am we had been welcomed to the heart of it all, in Ohio and were just starting to see what the Ohio Expo Centre and Quarter Horse Congress had to offer us. 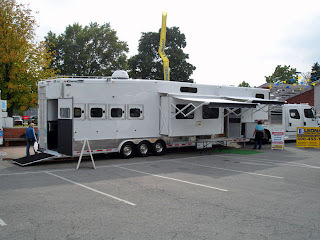 Before we actually got to the show arenas, we had to pass through a sea of trucks and brand spankin' new horse trailers just begging for us to do a walk-through. 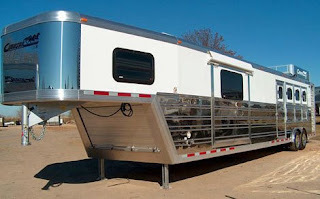 Some had room for up to 6 horses, others had up to 6 flat screen tv's in the living quarters! We even saw one with a small fireplace! 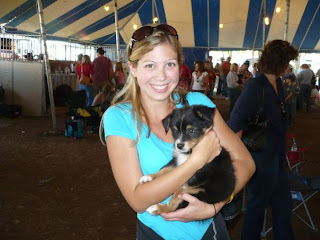 As we entered the show grounds there was a tent full of breeders and their puppies. There were Great Danes, Border Collies, Golden Retrievers, Bull Dogs, Australian Sheep Dogs, and every size, shape and colour in between. Next we followed a not-overly-detailed map to an arena towards the back of the grounds and found a cutting demonstration. Stallion Avenue was just getting prepared for the weeks to come. Stallion Avenue is a part of the vendors area designated for some of the Million Dollar Sires in the industry to be promoted. 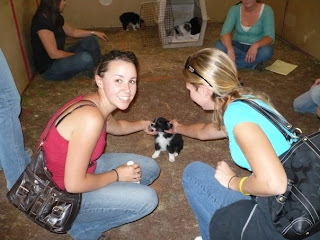 Many stalls were set up with tv's to watch videos of the horses in competition and at their home farm. 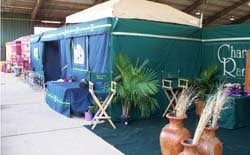 The stalls for exhibitors were decorated in farm colours and many hosted small bars or lounges, flowers, pictures, candies etc. 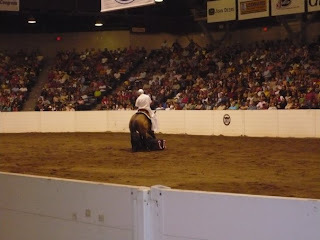 Finally, evening came and with it came the Open Futurity Finals. Futurity winners are posted below, check out some of the big names and up-and-coming horses. We also saw Todd Sommers, Craig Johnson, Brian Bell, Craig C Schmersal and congratulations to Harvey Stevens from Ontario! The next day was full of shopping, shopping and more shopping. 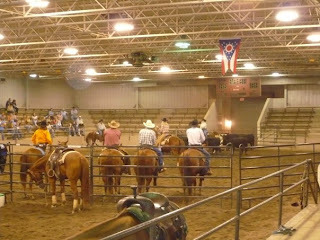 We stopped briefly to watch the Cinch Freestyle Reining warm-ups in the morning and the Working Hunter Youth classes. Early afternoon I was lucky enough to meet up with two friends and fellow graduates of Meredith Manor Mary Lew and Kelly. 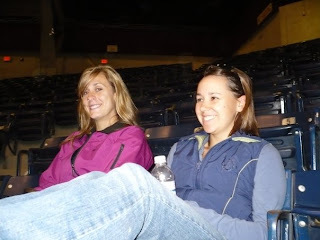 Mary Lew Johnston (pictured below-right)is now a full time instructor at the school, and Kelly Lagos (pictured teaching below) runs a successful boarding, training and lesson facility in Virginia. We try to meet up every year at Congress as sort of a reunion. We use our time to get caught up personally as well as collaborate and share stories professionally. We compare notes on teaching styles, our own riding and training techniques and how they evolve and usually have a lot of laughs. 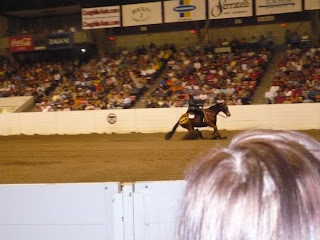 By evening, cold beers in hand we were ready to watch the freestyle competitors demonstrate their own reining patterns, costumes and musical choices. The arena was packed and we ended up with seats in a box in the front row! The first exhibitor had a Batman costume complete with batman symbols and large wings attached to the saddle. One exhibitor played on the loyalty of the fans in their home state of Ohio and dressed as a Buckeye, complete with marching band! A particularly moving pattern was ridden in support of cancer research. 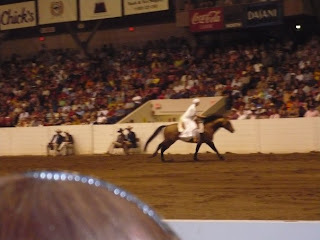 The ride was done bridleless, and the horse kneeled down (as if in prayer) as seen in this photo. 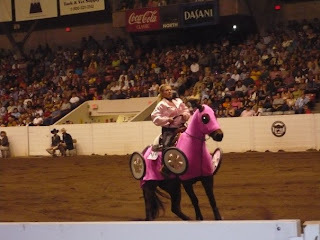 I thought this costume was very cute, the horse is supposed to be the rider's pink cadillac! 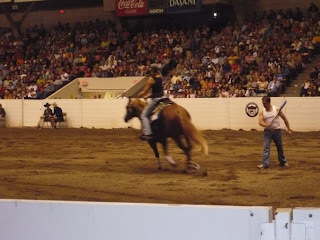 The winner of the freestyle rode with only a leadrope. Click this picture to watch the video, don't forget to turn up the volume and watch through to the very end! The trip proved to be a lot of fun, maybe a bigger vehicle for next year and maybe a bigger group of people if anyone wants to join us! Rain Rot?... is my horse rotting from the rain? We are all noticing a change in our horses hair coats by now. The slick, shiny summer coat is gone and is replaced by a thickening, furrier one. 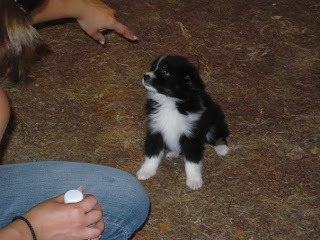 Your horse is starting to look like a fuzzy bear, and in running your hands over her thick coat you notice some small bumps. Each day you come out there appears to be more, and more....and then they get bigger and bigger. Your horse could have a condition commonly referred to as "Rain Rot". Unfortunately, due to a wet summer and wet fall, the prevalence of this condition has increased. Treated NOW, it's nothing to be worried about. You may need to avoid riding for a short period of time while your horses skin recovers, and you'll need an experienced helper to get the treatment plan down pat to get rid of it ASAP. I found the article below very thorough, although the treatment plan I will use is a bit different. Have a read through, and then check out my suggestions at the bottom. Rain rot is one of the most common skin infections seen in horses. It is also referred to as "rain scald" or "streptothricosis". The organism that causes rain rot appears and multiplies in warm, damp conditions where high temperature and high humidity are present. This condition is not life-threatening, so don't worry. However, while the horse has rain rot, any equipment that may rub and irritate the infected skin (such as saddles and leg wraps) should be eliminated. The organism dermatophilus congolensis causes rain rot. dermatophilus congolensis is not a fungus. It is an actinomycetes, which behaves like both bacteria and fungi. Most people believe that the organism is present in soil, however, this has not been proven. The organism is carried on the horse, who has it in his skin. A horse who has this organism in his skin may or may not be affected. What does rain rot look like? Rain rot can appear as large crust-like scabs, or small 1/4 inch matted tufts of hair. There is usually dozens of tiny scabs that have embedded hair and can be easily scraped off. Underneath the scabs, the skin is usually (but not always) pink with puss when the scabs are first removed, then it becomes gray and dry as it heals. It is usually hard to differentiate rain rot from other similar skin conditions, so if you are unsure, call your veterinarian. In the early stages, you will be able to feel small lumps on the horses' skin or hair by running your hand over your horse's coat. In what region is rain rot most common? Rain rot can be present in any horse around the world, but is most common in South Florida. In South Florida, the increased humidity and high temperatures combine with the prolonged rainfall to create the perfect environment for the organism to live. What conditions are usually present? 1. The animal has to be infected with the organism. A horse can become infected by shared saddle blankets, leg wraps and brushes with other infected horses. 2. There has to be extreme moisture present. Horses with thick coats are more likely to keep the moisture close to their skin. 3. The skin has to be damaged (by a cut or scrape), for the organism to be able to enter the epidermis. 4. Also, poor stable management, damp stalls, poor ventilation and infected barns. Will rain rot go away on its own? It sometimes does. What I mean is that some horses will naturally get rid of the organism as they shed out their winter hair coat. However, it is not advisable to let the condition persist, you should not wait to see if it will go away...start treating it now, before it gets any worse! Does rain rot lead to any other conditions? Since the organism needs a warm, moist environment, it is likely that a secondary bacterial infection may become present. The most common secondary bacterial infections known are staphylococcus (staph), and streptococcus (strep). This is why it is very important to treat rain rot immediately, since any secondary bacterial infection may be even more resistant and difficult to treat. How does rain rot spread? The organism, dermatophilus congolensis, can be spread through sharing of equipment between horses. This includes saddle pads, blankets, leg wraps, brushes, halters, etc. It is extremely difficult to prevent the spread of rain rot, since a horse can pass it to another horse by simply rubbing it's skin on any object that the other horse may touch. The best prevention for rain rot is to use a disinfectant on any equipment shared between horses after each use. When treating this condition, you must keep all equipment used on the horse disinfected, to be able to keep the organism from coming back. A good solution is 2 tablespoons to 1 gallon of water of Chlorox. Do not use this solution on your horse, only on the equipment! Where does rain rot appear? Usually on the horse's back and rump, along with the back of the fetlock and front of the cannon bone. It may also appear on the tips of the horse's ears and around the eyes and muzzle. When rain rot appears on the lower limbs (behind the fetlock), it is most commonly referred to as "dew poisoning". Are the scabs painful to the horse? 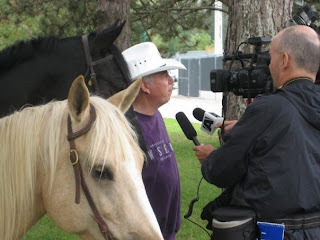 No, the scabs do not hurt the horse. The scabs have not been associated with an "itchy" feeling either. However, it may be painful while you are removing the scabs, so be very gentle and take your time. Many horses will be resistant to this. Dermatophilus congolensis grows better with a lack of oxygen. Since the organism doesn't like oxygen, you'll have to eliminate a the heavy hair coat (if your horse's hair is long and thick), and remove any scabs that hold the organism to the horse's skin. It is not a good idea to use ointments on rain rot, since they hold moisture to the skin (and moisture needs to be removed for the condition to cease). The best treatment is to wash the horse with antimicrobial and antibacterial shampoos and rinses. These medications help to kill the dermatophilus congolensis organism. If Betadine, Phenol or Nolvasan is used, you should continue applying them once a day for one week. 1. 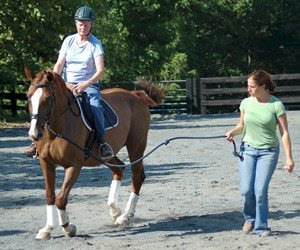 Keep the horse in a dry, clean area that is very well ventilated. Give the horse protection against biting insects. Separate the horse from any others that also have rain rot. 2. Use an antimicrobal shampoo that lathers well. Vigorously lather the horse, let sit for 10 minutes, then rinse. Be sure to follow with a conditioner that works well. Continue this for daily for 1 week. 3. Remove all scabs that are present. This is usually painful for the horse, so be gentle! The best way I have seen to remove these scabs is to temporarily moisten them (so they become soft and easy to remove). Be sure to dry the horse immediately after scab removal. 4. The organism in the horse's skin must be killed. This can be done by using any of the products listed below. SEVERE CASES ONLY: for severe cases, antibiotics may be used. These include potassium penicillin, procaine penicillin G, sodium ampicillin, streptomycin or gentamycin. Immune-boosting drugs may also be needed for the horse's immune system to fight off the organism and heal. If your horse has a severe case of rain rot, make an appointment with your veterinarian and discuss the antibiotics listed above. Last week one of my students beloved horses came in with a bad case of rain rot. We knew the horse wasn't in her best physical condition and had attempted to keep her groomed regularly, bathed, ridden, feet cleaned out etc. as best we could. Despite our efforts, the small bumps spread quickly and turned into bigger bumps. SO, now for treatment. The betadine scrub decribed above is the best thing I have found. Unfortunately, it usually required a visit from the vet and a small bottle at an astronimical price. I have since been told about using an iodine solution which is considerably less expensive and seems to work just as well. Before I go to the barn, I mix a tiny bit of bleach in with a full spray bottle with water in it which I will use to disinfect any grooming tools that I will use that will not be thrown out to prevent spreading. I lather the horse with the iodone each day, and use a small curry comb to get the iodone right in under the thick coat to the skin. I am armed with my latex gloves, a bucket with some warm water to rinse with after the iodine sits for a few minutes. Shapley's MTG is also a great way to keep the coat in good condition and soften the bumps when they are ready to be picked off. I'll keep you posted on the mare's progress. Any questions, don't be afraid to ask! Who's that in the London Free Press and on A-Channel News?!?!?!?! Your favourite lesson horse, Blondie. Blondie flashed her gorgeous smile and batted her eyelashes for cameras Wednesday, October 1st for the press conference covering UWO's Homecoming. Why (other than the fact that she's simply the best) was Blondie chosen for this photshoot?? 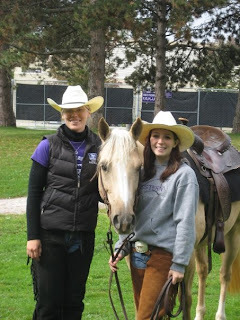 In the picture below beside me is Daina Robinson, the VP for Western for the UWO Equestrian Team. 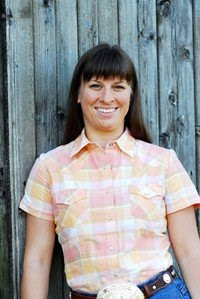 Daina (and executive) work hard each year to put together a series of lessons, both english and western for members of the team. 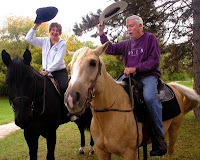 They also put together an annual trail ride, nights out to Cowboys Ranch, horse shows and an equine massage therapy clinic. After coaching several of the girls on the team last year, I have been chosen as the official western coach! Thus, Blondie and I made our way down to TD Waterhouse stadium for pictures. Daina got the team set up to provide horses and cowboy hats for the press conference for homecoming. She was even persuasive enough to get permission for the UWO Equestrian team to be the riders on horseback carrying the Western Mustangs flag, racing full tilt one lap of the field when the western football team scores!! What an honour it is to have been named the official Western Coach! Thanks girls, looking forward to our lessons together! I came across some videos I thought you may be interested in. If you have never seen these before they will be great examples of the sports they represent. 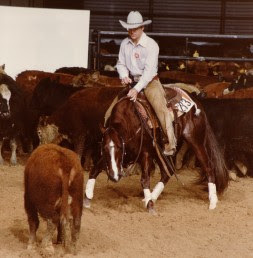 For those of you interested in cutting and reining, you will get a kick out of these "oldies but goodies"! 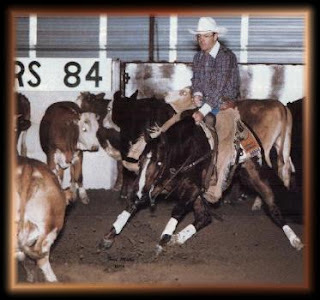 Smart Little Lena is the all time leading cutting sire and one of only three horses to ever win the NCHA Triple Crown. The Triple Crown is made up of the Futurity, Super Stakes and Derby. Smart Little Lena's lifetime earnings: $743,275 in only eight shows! He has 550 money earnng offspring to date which have earned $26,565,935 and reining offspring have earned $484,412. 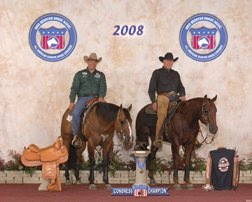 He has sired 17 world champions and 11 reserve world champions. 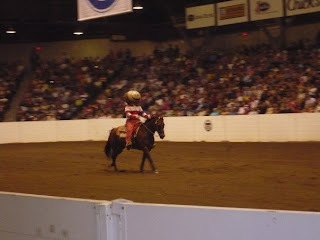 I had the opportunity to visit Smart Little Lena while at the 2007 NRHA Futurity in Oklahoma. He still stands at stud at Tommy Manion Ranch in Aubrey, Texas. When I saw him, he had recently had surgery to remove one of his testicles which I believe was cancerous. He was recovering well. Smart Little Lena has been one of the first horses to ever have been cloned. CLICK THIS PICTURE TO WATCH THE VIDEO! Hollywood Dun It was by the great Hollywood Jac 86 and out of Blossom Berry, an own daughter of Dun Berry. 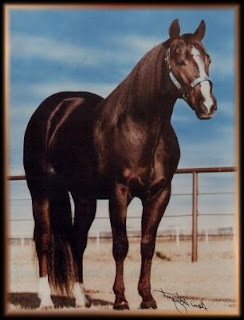 During his show career, Hollywood Dun It was the National Reining Horse Association Futurity Reserve Champion, the NRHA Derby Champion and the Superstakes Champion. 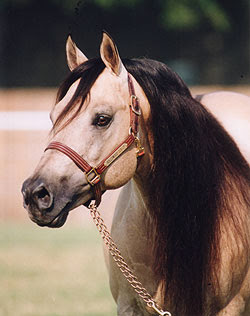 A 2000 NRHA Hall of Fame inductee, the beautiful dun stallion is the NRHA's Leading All-Time Sire of Reining Horses, with sons and daughters whose earnings have surpassed the $4 Million mark! Hollywood Dun It, born is 1983, passed away in 2005. 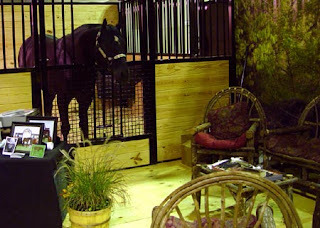 I was lucky enough to visit McQuay Stables in 2007 to see the former stall of the famous stallion, some of his stablemates and offspring (seen in the McQuay Stables Promotional video).